';Faith is permitting ourselves to be seized by the things we do not see.' --Martin LutherDo you ever wonder whether you're really a Christian and cling to what's left of your faith when you feel like an outsider even among other believers.Have you ever doubted your faith? Have you ever, deep down in your heart, doubted that God was really present in your life? Or wondered whether everything you … believed in as a Christian was false?Call it existential doubt. Call it ';the dark night of the soul,' as one Christian saint famously did. Whatever you call it, it's real. It is personal, it is painful, it is distressing, and it can last for years? maybe even a lifetime. 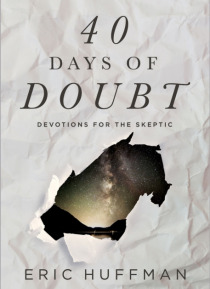 But you are not alone.40 Days of Doubt: Devotions for the Skeptic is for all those sports-talk listening, eye-rolling, Game-of-Thrones-loving, abnormal believers out there. If you've ever felt that your mind and soul were fighting, you'll find solace in these awe and wonder-filled reflections by pastor and author Eric Huffman. This devotional helps us understand how we can cope with our questions, and provides insightful answers during our times of doubt.